Embark on historic pioneer routes along a figure-8 of stunning mountain views. Your wheels will sing under the big sky, as miles of remote open road beckon on the Grande Tour Scenic Bikeway. Relax, inhale the fragrant sage and crank on through beautiful northeastern Oregon. 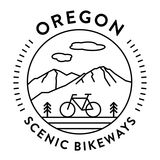 This Scenic Bikeway covers some of the route traveled by pioneers on the Oregon Trail. 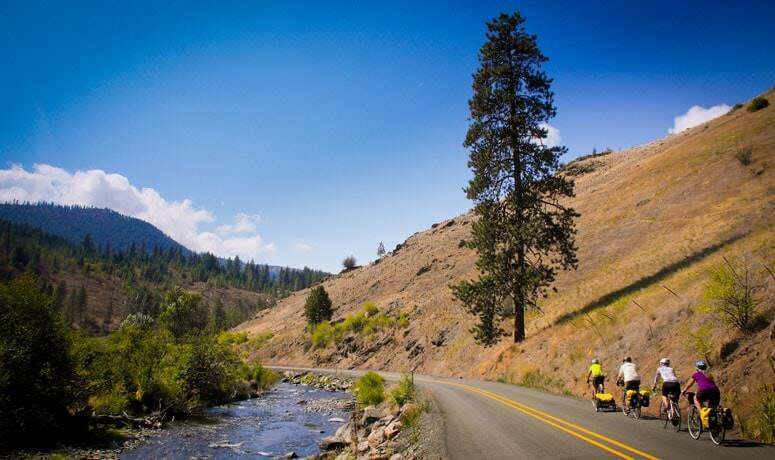 You’ll feel like a bit of a pioneer yourself as you discover the clear streams and serene farmlands, the scented canopy of ponderosa pine forests, the towering windmills and the sweeping sagebrush rangelands of beautiful Eastern Oregon. While you’re in the Oregon backcountry, watch for elk, bald eagles and pronghorn antelope as you take in stunning mountain views of the Elkhorn Range, the Blue Mountains and the Eagle Caps of the Wallowa Mountains. In the flatlands, you’ll enjoy pastoral views of cows and horses grazing. Stop and explore a pioneer cemetery or visit an art gallery or bronze foundry in Joseph. Reconnect with your soul. 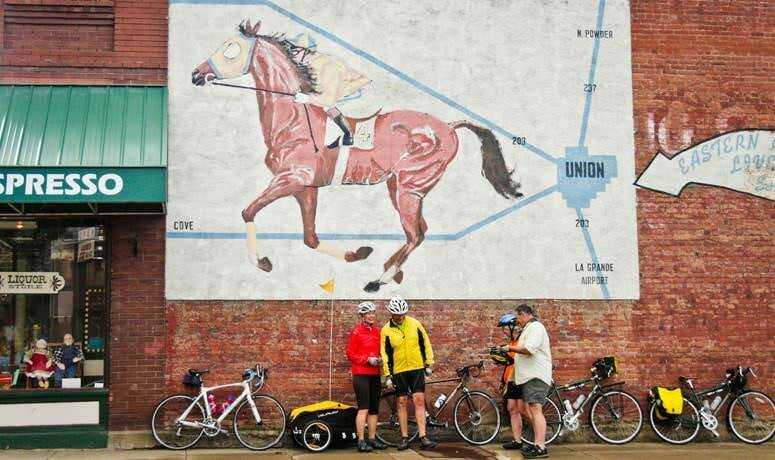 This 134-mile ride takes you through or near several historic small-town communities. In peaceful Union, check out the majestic historic hotel, plus a stop at leafy and idyllic Catherine Creek State Park might be just the thing on a warm day. A roller-coaster of a ride through open range will take you into Baker City at the halfway point. The friendly hamlet of North Powder waits your arrival on the way back to La Grande. This is a great trip for riders of all skill levels, as the roads are wide and have limited traffic. This Bikeway’s proximity to all types of services and amenities means you can navigate a challenging non-stop ride or break the trip into leisurely segments. Adventure cyclists seeking a challenging ride can tackle the entire 134-mile figure-8 route. Cyclists wanting a more leisurely trip can divide their ride into segments of the route. Your ride begins at Riverside Park in La Grande, population 13,000, with restaurants, motels, a bicycle shop and grocery stores. 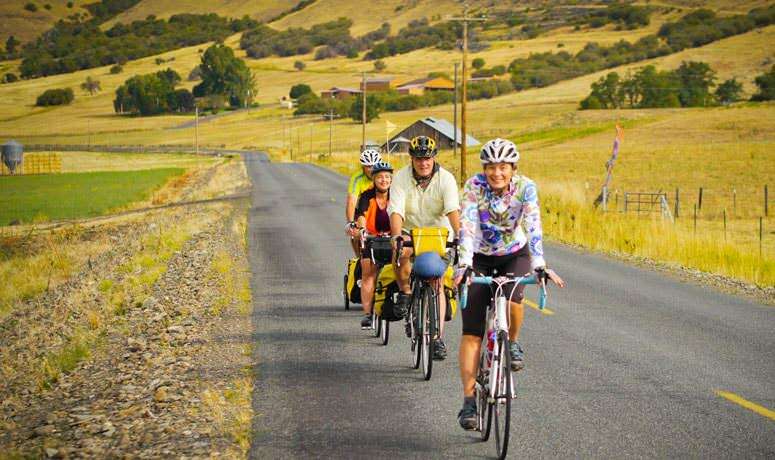 The halfway point of the route is historic Baker City, where you can refresh and spend a relaxing night enjoying excellent dining and accommodations, stop by the local bicycle shop and/or enjoy an award-winning microbrew. 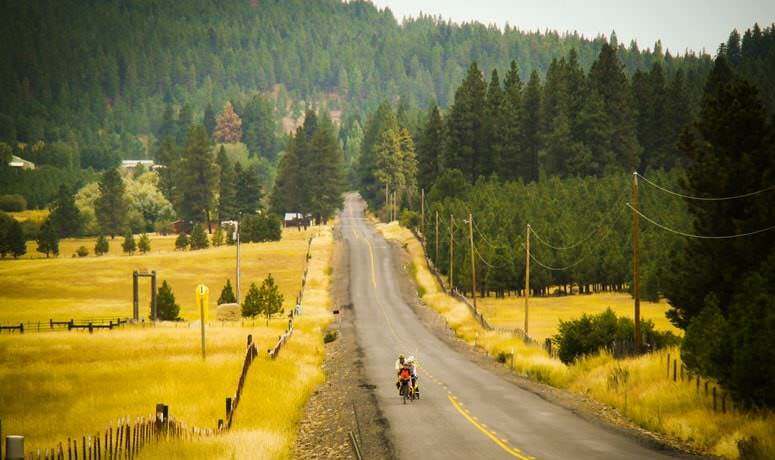 For more to see and do near this Bikeway, check out Visit Eastern Oregon or Visit Baker. Find camping and restroom facilities at Catherine Creek State Park, 13 miles southeast of Union on the Medical Springs Highway, and Hilgard Junction State Recreation Area, 8 miles west of La Grande off Highway 224. In addition to TripCheck.com, please contact ODOT offices in Union County, (541) 963-1016, and Baker County, (541) 523-6417, for current information about road conditions.